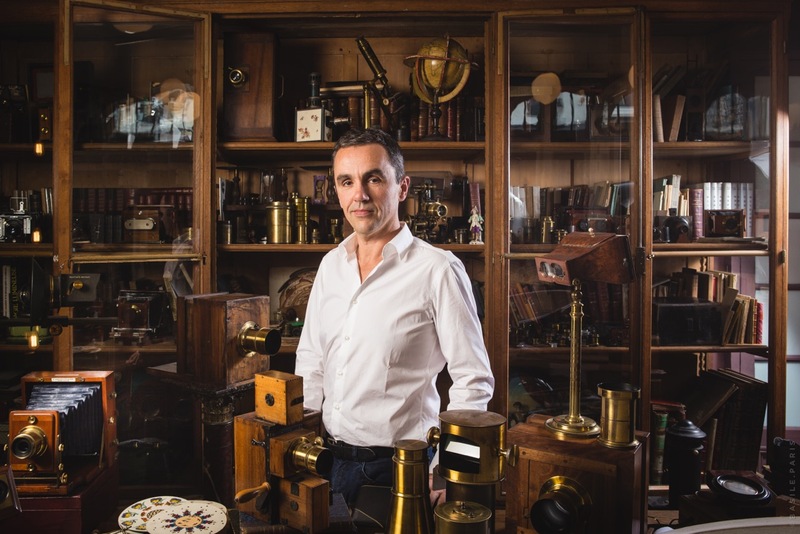 After some years in the Antiques Quarter in Toulouse, Sébastien Lemagnen set up shop in Rue de Vaugirard, Paris in 2007. The gallery-boutique is a cross between a veritable museum and a cabinet of curiosities, where collectors come to browse through a selection of vintage cameras, photographic prints and processes from the 19th century, early movie cameras, optical toys and scientific instruments. Sébastien became interested in the history of photography and cinematography in his early career as a photographer for a famous Parisian press agency. Sébastien is an avid explorer, self-taught, passionate and patient. He is constantly searching for new and important pieces and rare documents in France and abroad, from private sources, major collections, auctions etc. Thus, historic objects that may have been dormant for years reveal their stories of another era. The diversity of his interest concerns not only the cameras and (pre) cinematographic apparatus themselves, but also their production. He has become one of the major specialists in the history of technical developments from the invention of the Daguerreotype to modern photography and from the first moving images to the birth of the cinema. Driven by the uniqueness of each new discovery, his experience is derived from prospecting and treasure-hunting, with the ultimate aim of learning about the origins of the items he finds. The multitude of technical innovations of the 18th and 19th centuries are a permanet source of wonder to him. For example, a shadow theatre, the 3d effect, early automatons, light shows, the uniqueness of the Daguerreotype, the excitement of the first cinematographic projections, etc. etc. Thanks to these inventions he has followed a boundless passion for his vocation for more than 20 years. His wealth of encounters and experiences has led Sébastien Lemagnen to achieve notoriety in his field, making it possible for him to fine-tune the very demanding approach he has to his work, both in a personal and in a professional way. His new gallery-boutique, which opened in 2013 opposite the original store, is a place prized by amateurs, collectors and of course photographers themselves. It is the guardian of a thousand and one treasures of early technology allowing visitors to can come face-to-face with the first photographic and cinematographic processes, and also with the universe of scientific, optical, accoustic, electric and even astronomical apparatus and optical toys.